Sustainable House Day 2010 happens on Sunday 12th September across Australia. Sustainable House Day gives people the opportunity to walk through and talk to those who have already experienced the journey of making their homes more sustainable. From the outside many of these dwellings just look like any other house, but on the inside utilise various active and passive means of saving energy, reducing heating and cooling bills and minimising on water usage. 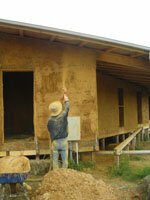 I will be at a strawbale house in Merrimu- it is the house that is featured in the strawbale section of this website, and I was a small part of the big team who contributed to the building of this lovely home. If you'd like to visit the house during the open day, take a peek at Peter and Natasha's blog for details and maps.